I have discovered that John Lennon was a polygamist. It is unknown the number of wives he actually had. Cynthia was his first wife and he married her in 1962. She was his legal wife. However, wedding ceremonies were performed with at least 2 other brides. This one pictured here was from April 1964 and was to a girl named Jeni (last name unknown at this time). It is said that he met her one night during the making of A Hard Day's Night. 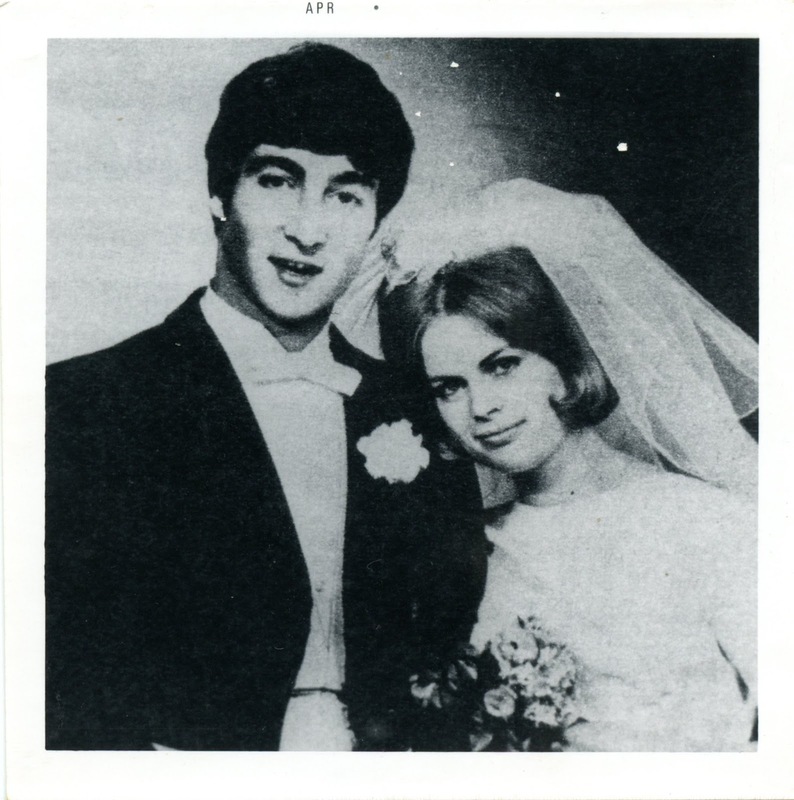 John approached her about being his second wife and she loved the idea of being married to a Beatle. Cynthia was not so keen on the idea and so Jeni lived in a flat in London. In 1965 John took his 3rd bride, who we think is named Marsha (or Marcha). John met her during the filming of Help! Marsha moved in with Jeni. It is my understanding that the other Beatles knew that John had more than one wife and they did not approve but thought John should be allowed to do whatever he wanted. John gave George the line in the song "Taxman" which said "There's one for you nineteen for me" because John ultimately wanted to have 20 wives. (19 plus the one legal wife) but George was happy with just one wife, Pattie. Once Yoko came into the picture, she wanted to be the #1 legal wife. Once John met Yoko, he slowly gave up his idea of having 20 wives and decided to divorce Cyn and make Yoko the legal wife. He tried to talk Cyn into staying on as one of his wives, but since she never liked the idea in the first place, she left. Soon afterward, John ended all communication with Jeni and Marsha (Marcha?). We would never know about this if Jeni hadn't recently come forward with this photograph along with her story. APRIL FOOLS! Of course, John Lennon only had one wife at a time and this is just a photo that a fan made in the 1960's. I am sure I didn't fool anyone, but it is fun to write a little bit of fiction now and then. I hope you all had a great day! Sara, you would not believe the number of times I've seen this photo on Pinterest, etc. as "John Lennon marries Cynthia". The ignorance is quite astonishing. 4th rate photoshop, and "He was his legal wife"? If you want a hoax or a joke to be convincing, you can't make that kind of gender error, or your lack of proofreading becomes the real joke! It was just a silly April Fool's joke and not something to be convincing. But nonetheless, I fixed the mistake.